Eurol supports Coronel and Panis in the FIA WTCR 2019 | Eurol B.V. The sponsorship of the Frenchman Aurélien Panis is new and is in line with the international expansion of the Eurol brand. 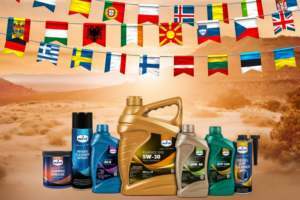 Eurol products are now available in more than 75 countries and we are active on many fronts to strengthen our international brand awareness and reputation. Aurélien Panis, son of former Formula 1 driver Oliver Panis, has been active in the racing world for years. Aurélien started his racing career in karting and formula racing and switched to the WTCR in 2017. Tom Coronel is a race icon, internationally known as WTCR driver and Eurol ambassador. Tom about the collaboration with CUPRA: “With SEAT I have achieved a lot of successes in the CUPRA over the years. I am focussed to get some ‘moments of fame’.